My couponing husband is always getting us some awesome deals. Awhile back, he got a whole bunch of Duncan Hines Dark Chocolate Brownie mix for next to nothing. Preheat oven to 350. Lightly grease baking sheet(s). Combine the coffee and water in a small bowl. Stir until the coffee is dissolved. Then, combine the mix, coffee mixture, egg, olive oil, and cinnamon in a bowl. Next, stir in the chocolate chips. Then, drop rounded teaspoons of the dough onto the baking sheet. Put in the oven for 6-8 minutes. Be sure to stick to about this time--if you over bake, the cookies will be pretty flat. (They still taste good, but flat in appearance.) Take the cookies out of the oven when the edges are just set. The middle will still appear doughy. Let cool on cookie sheets for 4 minutes. 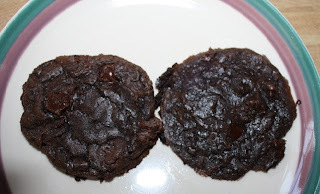 I am not sure if you can tell in the picture below, but the cookie on the right was baked too long and is much flatter than the one on the left. Both taste great and really have a nice zing from the cinnamon! If you have some Duncan Hines mix you would like to jazz up, check their websites for recipes. thanks..I actually never thought of checking their website for ideas..i try it on my own with mixed results. thank you!! i learned something new! !